2700 West is quickly becoming a go-to for late night food near the campus of Western Michigan University. It wasn’t that long ago, I was complaining (for many years) that there was no pizza by the slice place. Not the case anymore. 2700 West is home to Hot Slice. Add in Old Goat Tavern and you have some pretty good newer options in the Knollwood Neighborhood that compliment some of the established late night options near campus. A couple of weeks ago, another option popped up in 2700 West for late night meals. 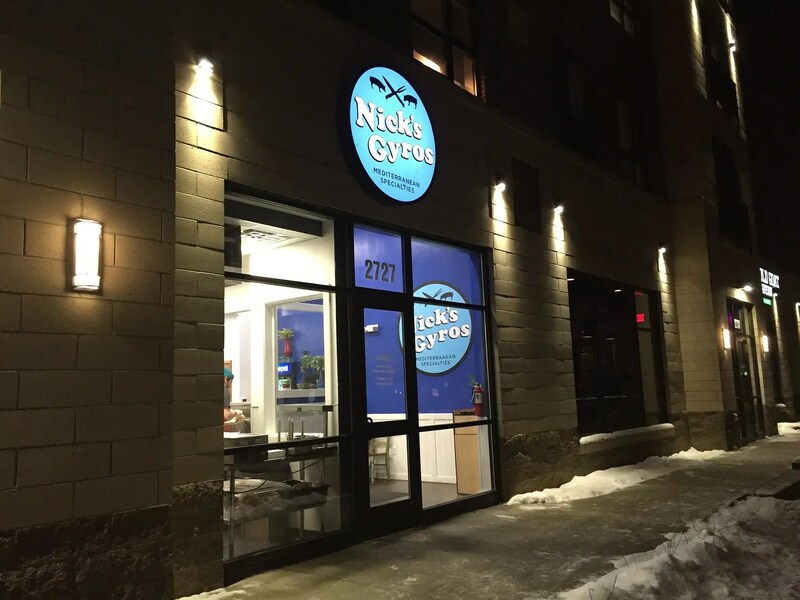 Nick’s Gyros made the leap from food truck to brick and morter location. 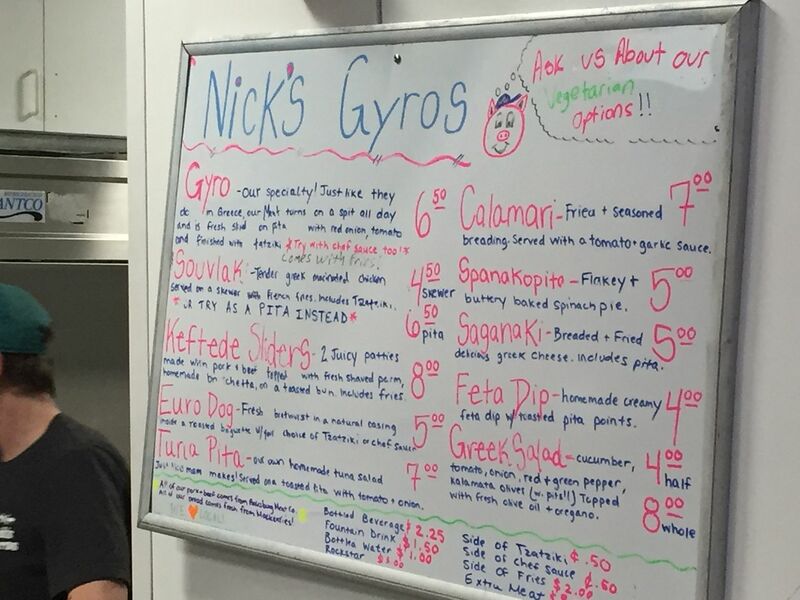 I walked by Nick’s Gyros many times at Lunctime Live at Bronson Park last summer, but not being a huge gyro fan, I never stopped. I heard so many people raving about them though that I had to give it a try. 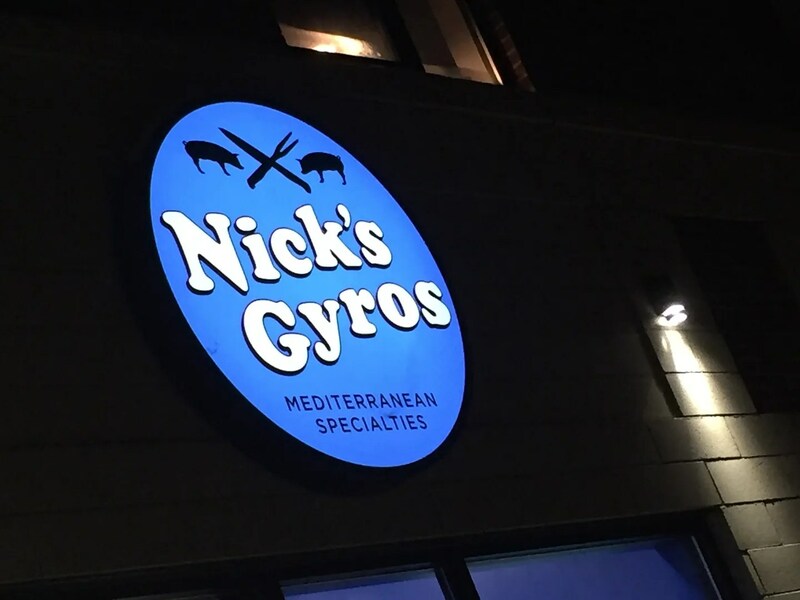 Nick’s Gyros takes up one of the many retail spaces inside 2700 West on West Michigan Avenue near Howard Street just west of WMU. It’s long, narrow space that does mostly carry-out. There are a few tables down the hallway connecting the back entrance to the front where the order counter is, but there’s really not a lot of eat-in space. Parking is the biggest issue at 2700 West. There is a huge parking lot on the backside of the building and that actually works out OK for Nick’s as they have a back entrance. I didn’t realize that and I ended up parking at the old 7-11 next door. I justified that by going in to the party store to grab a couple bottles of Pepsi although I actually could have done that at Nick’s. I stopped in on a Thursday night just before midnight. There was a pretty good line of people all waiting in the small pick up area for food. I squeezed my way through to the cash register where a dry erase board with hand written menu hangs. I have been so hesitant to actually stop at Nick’s because I can’t find a menu online. They have a Facebook page that’s updated every couple of days and no actual website. I searched and searched but couldn’t find a menu anywhere. The Facebook page has a post saying they take call-in orders, but there’s no picture anywhere of what they actually offer and I didn’t even see take out menus in the restaurant. I just snapped a picture of the menu with my phone for future reference and for this blog. Gyros are pretty much out for me because I don’t like the tatziki sauce. I would be happy with just a pita filled with lamb, but that seems like not a very good deal. Instead, I ordered the Keftede Sliders (which come with fries) and Saganaki. The bill was just under $15 which I paid for on my card then got in line with everyone else waiting. For as many people as were in line, the wait wasn’t all that long. It took a little more than five minutes for me to be handed two Styrofoam containers of food. When I got home, I started in with the Saganaki first. I really shouldn’t have. 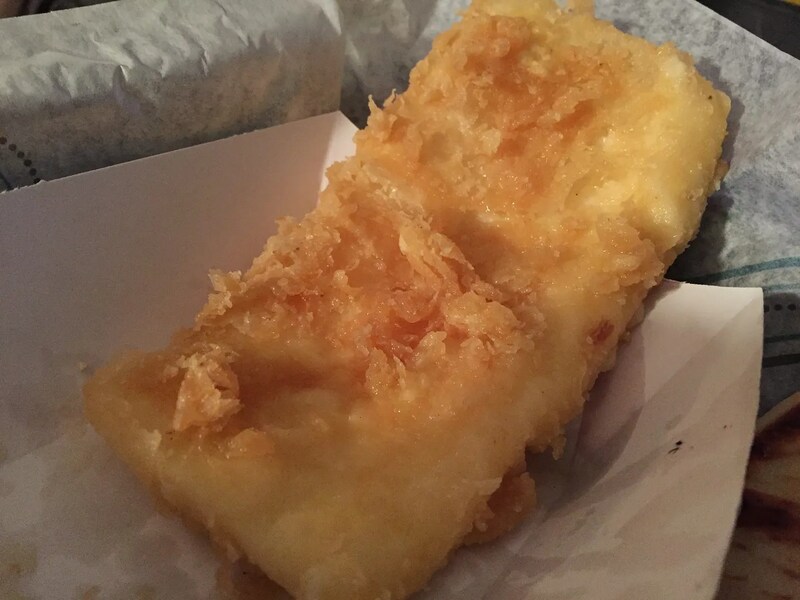 Fried cheese always sounds delicious, but I don’t think this one was made right. Not exactly sure what kind of cheese was used. The menu just says “greek cheese.” The breading was really, really greasy….like the frying pan wasn’t hot enough or something. I’ve had really good Saganaki in the past, but this one just really missed. I only took two bites of it before I just gave up. The cheese came with a lemon for squeezing over it and slices of pita bread which were really delicious. I didn’t let those go to waste. The Keftede Sliders were quite the opposite of the saganaki. They were quite delicious. 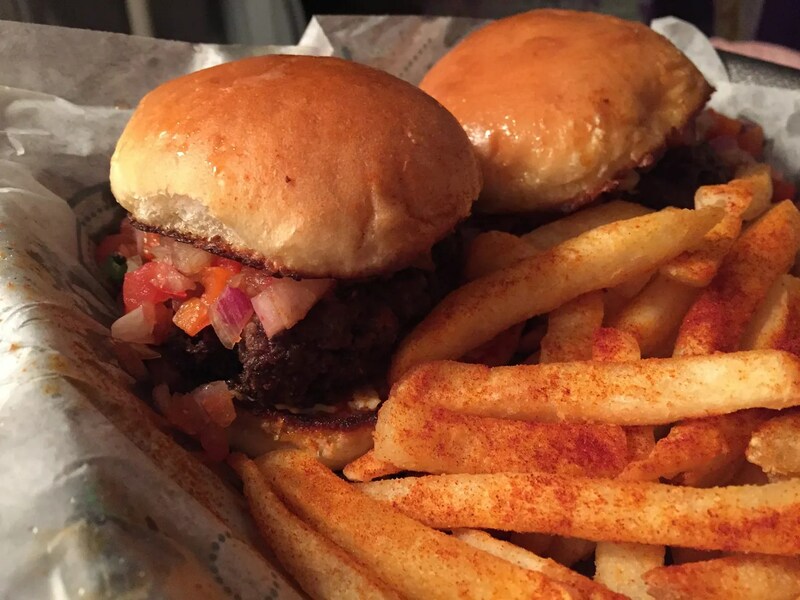 The two sliders came with a patty consisting of lamb and beef that had been fried to a crispy outer skin but the insides were tender and juicy. Each of the sliders was topped with shaved Parmesan cheese and a house made bruschetta made of onions and tomatoes. I slid off most of that because the onions completely dominated the flavor….great if you like onions…I really don’t…but the Keftede itself was delicious. I’ve been craving Mediterranean meat ever since Christmas when a co-worker ordered us a feast for Christmas Dinner at work. This went a long way to satisfying that craving. The side for the sliders was fries. They battered and seasoned with what I believe was a parika-based seasoning. They were good, but like the Saganaki, a little on the under cooked side. That doesn’t bother me with fries though. These fries were still delicious and there was a lot of them. Had I finished the saganaki, I definitely would have over-eaten. I easily could have gotten by and felt totally satisfied with the sliders and fries. Nick’s Gyros was both hit and miss for me. The Keftede was delicious. The saganaki, not so much, but I’m going to chalk that up to a one time mistake. Nick’s seems to have a huge following from their food truck days that will easily carry-over to this new store. I love having another new late night option so it’s not always frozen pizzas or leftovers when I get off work at midnight. I’m sure the college kids feel the same way.